Christina Hills was an animator for the network promotions division of NBC-TV in Burbank, CA, spending five years as a senior technical director in the Feature Film Division at George Lucas’s Industrial Light & Magic in Marin County, CA, working on films such as Star Wars: Episode I, Jurassic Park II (The Lost World), The Perfect Storm, ET the Extra Terrestrial (re-release), Twister, Mars Attacks!, and more. Then she had a baby, quit her job and moved to the Sierra Mountains. Isolated in the mountains, far from any city with jobs available, Christina’s solution was to work from home. Initially, she worked in her husband’s online sales training business, but with differing opinions on business style and management, it became too difficult. It was the early 2000’s and web design was in demand. So Christina taught herself web design, building websites for others. Given the high volume of general web designers available, she decided to choose a niche area – shopping carts. She became known as the “Shopping Cart Queen”, helping business owners by adding e-commerce shopping cart functionality to their websites. In 2008, Christina decided to create the Website Creation Workshop, which teaches non-technical people how to easily create a website using WordPress. She believes in making it simple for “regular people” to understand. Her workshop has now been taken by 2,789 people to date. Business owners from all walks of life have taken it, including coaches, consultants, authors, speakers, doctors, healers, virtual assistants, and artists, to name a few. 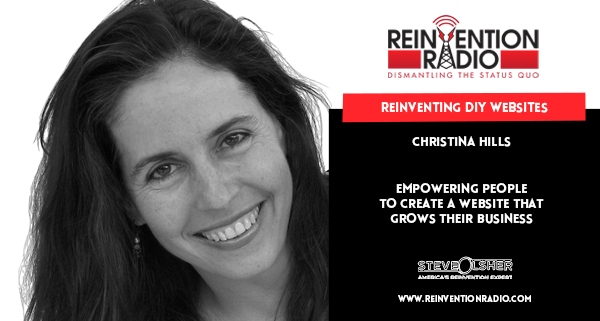 Tune in to hear Christina, Steve, Mary, and Richard discuss how she empowers people to create websites that grow their businesses. Why would you leave the dream job? What’s next for Christina Hills? Reinventing Jordan Harbinger Pt 2 – In this episode, tune in to hear Jordan Harbinger, Steve, Mary, and Richard discuss how to upgrade your mind with wisdom from the most brilliant people.